We’ve had many family members in and out of our home since Sammy was born. And they have not only come to cuddle with the little cutie, they’ve also cooked for us and cleaned for us. While Nick’s sister, Kirsten, was visiting a few weeks ago, she whipped up a delicious batch of seasonal soup. But I’ll let her tell you all about it. Take it away, Aunt Kirsten! For the past several years, I have ventured up to Amish Country in October to the famous “funky pumpkin patch” (a spectacular Amish farm) near Spooky Nook Road (a perfect name for a pumpkin mecca) outside of Lancaster, PA.
My Aunt Vicki introduced me to this impressive venue of countless pumpkins, gourds, and squashes of all sizes, shapes, and colors. It has become a tradition to make the gorgeous drive to fill my trunk for a tenth of the cost of what I would pay for such purchases in Northern Virginia. My office and home have impressed many with tables and countertops covered in a sea of fall colors and produce. It is by far my favorite time of year! This year was no different than years past with a trip to the funky pumpkin patch. However, during this trip, I was also in search of a butternut squash for a recipe I planned to make for The Culinary Couple. Little did I know what Aunt Vicki would find! When she pointed out the pallet of butternut squashes, I joked that they couldn’t be real. I could barely carry the colossal marvel before me and was skeptical of whether it would even taste right. I decided that at a whopping $2.00, it was worth a shot, if nothing more than for a good laugh. 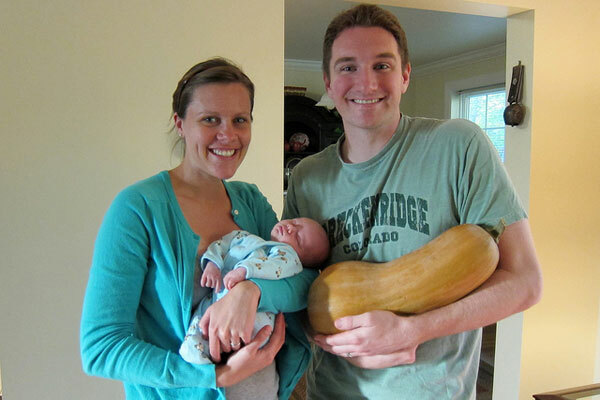 I hauled the monstrous squash from VA back up to PA to Nick and Emily’s place the following weekend. As seen in the picture (though Sammy has grown since) he didn’t stand a chance against this Amish-grown wonder. 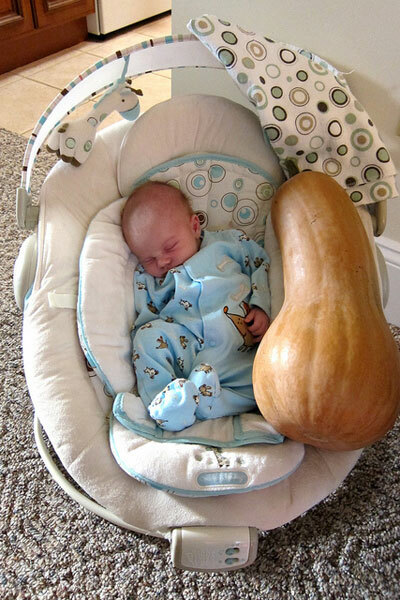 Sammy weighed in at a solid 7.25 lbs, and the butternut behemoth weighed in at a jaw dropping 10.56 lbs!!! After an exhausting hour spent peeling and chopping, Nick’s veggie baby became a roasted delight, which was pureed into perfection. After an hour of enjoying the mouthwatering scents wafting from the oven, we eventually had a delectable dinner. We served the soup with a simple side salad of mixed greens, pears, and pecans. And, in true Nick and Emily fashion, this meal is best enjoyed when accompanied by a delicious pumpkin ale. Sam Adams Oktoberfest was our beverage of choice but for those of you who live in the Northern Virginia area, I highly recommend the Sweetwater Tavern Pumpkin Ale, which comes with a rimmer of a combination of crushed toasted pumpkin seeds, brown sugar, and pumpkin spice (truly to die for). This meal is a perfect tribute to the wonder of the fall season! In a large roasting pan, combine squash, onions, garlic, apples, and oil. Toss to coat. Sprinkle generously with salt and chili powder. Roast, stirring every 10 minutes, until vegetables are fork-tender, about 45 minutes. 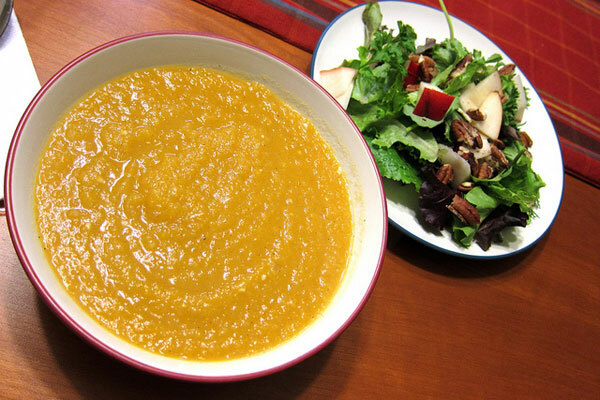 In a food processor or blender, combine half of vegetables and half of broth; puree until smooth. Repeat with remaining vegetables and broth. Heat soup on stovetop over medium-low heat, stirring occasionally, until heated through. Serve with an additional shake of chili powder. 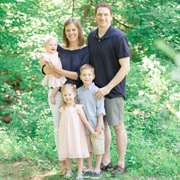 Great blog, Kirsten! 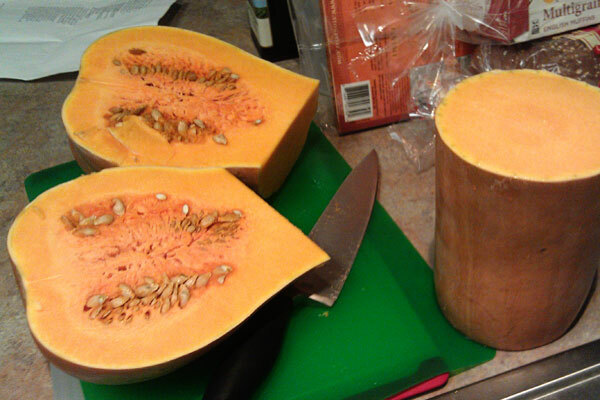 Awesome humongous squash! the soup looks yummy and sammy looks adorable!